Easy Enchiladas is one of MSC’s newest blends. It is hand mixed with paprika, onion, chili powder, garlic, Serrano chiles, cumin, salt, sugar, coriander and Mexican oregano. It is fantastic as a Mexican rub, in a salad dressing and best of all enchilada sauce! It is amazingly easy to make. The flavors are so complex and rich, it is hard to believe we did not add the whole veggies into this sauce. Fabulous! I ran into this lovely Mexican woman at the grocery store and she was kind enough to let me pick her brain in making this dish very authentic. She said when buying the corn tortillas, find the thinnest ones you can. They won’t fall apart like the thicker tortillas, which was very true. Also, finish the dish with Queso Fresco (Mexican crumbling cheese) and Mexican Crema, kind of a mix of sour cream and cream—delicious! 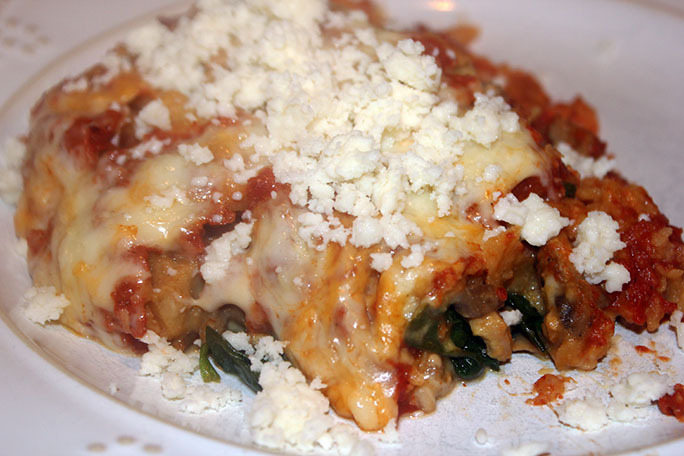 I chose to make a chicken, spinach and mushroom filling for my enchiladas. But, you can literally use whatever combo of veggies and/or meats that you wish. You can also use this wonderful sauce for Huevos Rancheros, Burritos, steaks, chicken and fish. This would be great on just about anything. My family loved this dish. I am sure yours will too. An iced cold Tecate beer pairs beautifully with this dish.